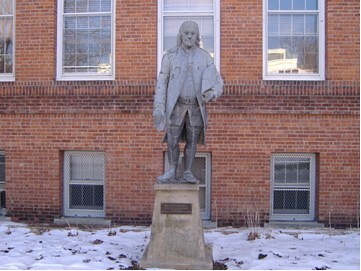 The plaque below the statue of Benjamin Franklin in front of Sanders Physics Building reads "Given to Vassar College by J.P. Morgan at the request of Burges Johnson, Professor of English, 1915-1926." The story of how Franklin’s likeness came to stand here is linked to how Burges Johnson came to Vassar. In 1914, working as literary advisor at the E. P. Dutton publishing house, Johnson was, at the age of 37, considering changing jobs. With funding from Joseph Pulitzer, the publisher of the New York World, Columbia had recently opened its school of journalism, and Johnson was considering joining the faculty as a part time instructor. He was worried, however, that the lower salary of the Pulitzer school—less than half what he made as an adviser at Dutton's —would be enough to support his wife and three children. Johnson had been asked to assemble expert witnesses for a lawsuit Dutton had filed to determing whether imported volumes in its "Everyman's Library" should be considered textbooks and therefore exempt from ad valorem customs fees. One of his experts he chose was Henry Noble MacCracken, a professor of English at Smith, who had formerly taught at Yale and who had used Everyman titles as textbooks in both places. Johnson decided to ask MacCracken for advice on his vocational problem, and MacCracken discouraged him from going to Columbia as aninstructor, on the grounds that typically instructors were young men expected to do all the odd jobs. Even though Johnson was more mature and more widely experienced than the other instructors, MacCracken urged, he would still be obligated to do the same menial work. The zinc statue of Franklin was given to Vassar by J. P. Morgan. Shortly after this conversation, MacCracken became the president of Vassar, and he wrote to Johnson: "If you are seriously thinking about the possibility of part-time teaching, why not come up here? We will allow you to go to New York for half the week, and we will treat you better at Vassar than Columbia would." In 1915, Burges Johnson and his family moved to Poughkeepsie, and he began his academic career, teaching at Vassar and spending three days of every week at his desk in New York. Before joining Dutton's, Johnson had worked for ten years at the Harper & Brothers publishing company on Franklin Square in New York City. A statue of Franklin had stood above the firm's porte chochere, and in his book, As Much as I Dare, Johnson recalled looking down on the statue from his office and thinking of the host of great American artists and writers who had walked beneath its gaze through the front door of Harper’s. In 1916, Harpers moved from the old building on Franklin Square to East 33rd Street, leaving behind the statue of Benjamin Franklin, as Johnson noted, "without the backing of literature and art." A leather trade set up at the old address, and the stench of untanned hides filled the building. Johnson asked Harper's what they were going to do about Franklin’s statue, and they replied that there was no room for him on East 33rd Street. He was a part of the building, they said, which was now the property of J.P. Morgan & Company. Johnson suggested that the tannery could not be greatly interested in the statue, and he asked whether Vassar might have it. Harper's replied that this was a question for Mr. Morgan to settle, but they offered to transmit, with their recommendations, any request Johnson cared to make. Johnson complied, and the nub of his argument was that "anyone who had read the life of Franklin would know he would rather rest on the Vassar Campus than any other place in the world." J.P. Morgan agreed to give Vassar the statue. It was lowered to a waiting truck and carried to Poughkeepsie. The life-size statue stood for some time just inside the doorway of Johnson's office. With the help of his students he removed layer upon layer of ancient paint. Johnson left Vassar for Syracuse University in 1926, and the statue was moved again, to its place in front of the new Sanders Physics building. Pleased with the new location of the statue of the founding father, pioneer in practical physics, and debonaire ladies' man, Johnson observed: "Today he stands on a pedestal outside the physics building, gazing down benevolently, and perhaps with a hint of more personal interest, upon successive generations of Vassar girls." The statue was restored in 2009. Cast sometime in the middle of the 19th century, the statue has required restoration from time to time. Made of zinc, "the poor man's bronze," as a recent restorer has noted, it was originally painted to resemble bronze. After a complete restoration, it was sealed with a bronze-colored preservative coating and returned to its pedestal in the spring of 2009. Burges Johnson, "As Much as I Dare," New York, 1944. 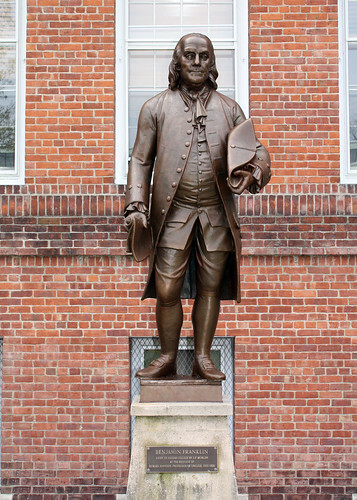 Brian Farkas, "Historic Benjamin Franklin Statue Returns after Year of Restoration," The Miscellany News, July 15, 2009.